Coherence and entanglement are among the fascinating properties of quantum objects. 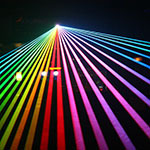 Similarly to light, atoms may be in two or more states simultaneously, such as the reflected and transmitted path of an atomic beam splitter or the two energy levels forming an atomic clock or a quantum bit. Spectacular phenomena like Bose Einstein condensation and squeezing arise when many particles form one macroscopic quantum object. In this project we study the coherence of atoms trapped in magnetic levitation above an atom chip. This geometry has proven full of rich physics, since the trap confinement enhances atom-atom interactions. Recently, we have discovered a new spin synchronisation mechanism  which leads to exceedingly long coherences times of 1 min, whereas most atomic physics experiments operate on the ms timescale. The synchronisation arises from atom-atom collisions, where the spins of two colliding atoms rotate around their sum. Today the question arises, whether these atom pair correlations eventually lead to entanglement of the whole ensemble and thereby potentially squeezing. Furthermore, does the spin synchronisation persist when all atoms “coalesce” in a Bose Einstein condensate and the notion of individual spins must be abandoned? – During this “stage”, we will upgrade the running set-up towards the capacity for detecting entanglement. The atom preparation and cooling will be extended into the BEC regime. The experimental findings will be compared to on-going theoretical studies. The candidate will join an international team of PhD students, post-docs and permanent researchers. He/she will benefit from the interaction with the cold atoms teams at SYRTE and LKB.